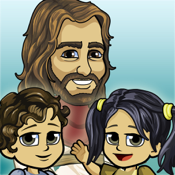 Give your kids hours of fantastic fun while they learn about Jesus! Lightside presents the Journey of Jesus interactive book series. Join Jesus and Friends in Chapter 1, where He does His first miracle. In this Chapter, we learn why we should always obey God. Every chapter of Journey of Jesus has a new story, and a new lesson. Search for all the funny animations hidden everywhere! Just tap your screen to explore the amazing world of the Bible. Kids love it, and so do Parents and Teachers! Your kids will fall in love with God’s Word and to play it over and over! NEW: Now also in Arabic and Chinese!